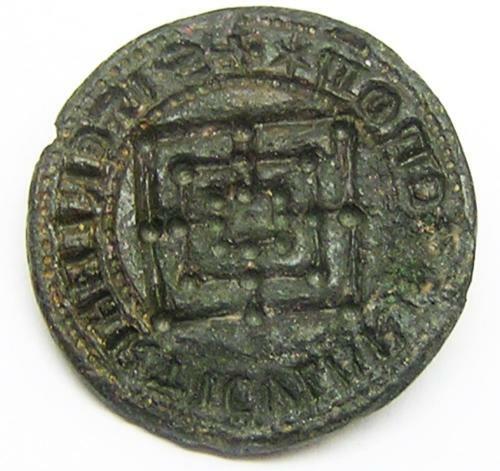 This is a wonderful medieval bronze seal, dating to the 13th - 14th century. This example is deeply cut with a full Lombardic inscription, around a central geometric design (that I believe represents "Nine Mens Morris"). This was a very popular type of board game, one that was played for many thousands of years. First recorded by the ancient Egyptians, then by the Romans through to our modern times. In some European countries, the design of the board was given special significance as a symbol of protection from evil, so it may have acted as an apotropaic symbol. The 'Morris' comes from the Latin word 'Merellus' which means a counter or gaming piece. Depictions of this game in art are known throughout the centuries, but this is the first instance I recall of seeing one on a personal seal. Interesting and highly collectible medieval object.